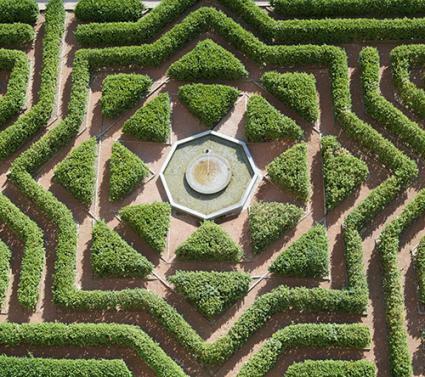 Formal gardens are geometrical, symmetrical, impeccable, and majestic. This classic style of gardening originated in Persia, and the courtyard gardens of the Islamic tradition, the Mughal gardens of Asia, the Italian Renaissance gardens, the intricate French parterre, and the English knot gardens of the Elizabethan age are all variations of this genre. With a few planning tips and a basic understanding of this design, you can create your own formal garden in the privacy of your own backyard. Formal gardens may at first seem like they require a lot of work, but they do offer some very nice advantages for your landscape. This type of garden is ideal for a small plot since it gives an impression of space and adds grandeur to the house. Since the plantings are limited in variety, they can be maintained easily in ideal cultural conditions. Except for flower beds with annuals, all shrubs and trees are permanent features, which keeps recurring costs low. 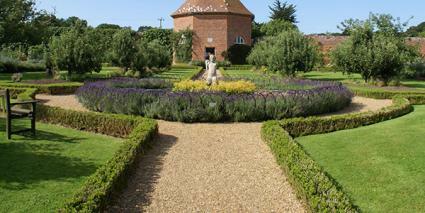 Devoid of clutter, a formal garden is very relaxing for the mind and body. Accurate planning is necessary during both the design and execution phases. Take into account the size and shape of the garden, its practical purpose, as well as the natural features of the land. Elaborate preparation may be necessary to make the plot suitable for a formal garden. A naturally flat terrain is ideal. Minor unevenness can be easily leveled with earth moving equipment. If there are major level differences, plan a stepped garden at two levels. A square or rectangular plot can be used as it is, but an irregularly shaped area needs to be trimmed into a regular shape. Tall hedges or high walls can demarcate the garden area from the rest of the plot. The main gate into the property may have to be relocated to fall in a straight line from the main entrance of the house. This forms the main axis of the garden. The layout should ideally be plotted on paper with exact measurements since it has to be carried to the site for actual execution. For the main geometrical shape, choose a circle, square, or rectangle. Stretching strings across stakes fixed in the ground can help you plot the straight lines from the plan on the ground. 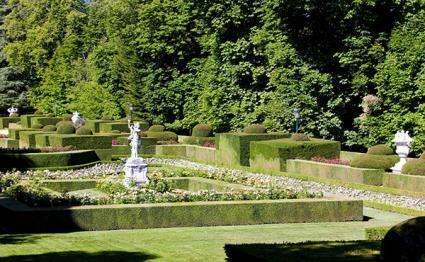 Symmetry is an important aspect of any formal garden, so the areas falling on either side of the main axis should be planned as mirror images. If the garden is intended for entertaining guests, plan on incorporating large open areas and seating arrangements into your plan. Wrought iron garden furniture complements a formal garden quite nicely. 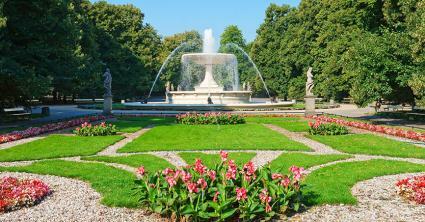 The following features are hallmarks for this style of garden. Pathways - The main path runs along the main axis and defines the bilateral symmetry of the garden. Other smaller pathways can branch off from it. They can be graveled or paved, and are typically lined with low hedges. Focal point - Placed either in the middle or at one end of the garden, a water feature, an interesting statue, a modern sculpture, or a large tree can serve as a focal point. Water feature - While a water feature isn't completely necessary, it's definitely welcome. Consider adding a pool with fountains, a canal running right along the main path or even a large bird bath. Vertical interest - Create vertical interest by adding topiaries, trees trained as standards or planted in a straight line, and stone or concrete pillars with decorative planters or large urns. Just be sure to use these features sparingly to avoid clutter. Greenery - Greenery, typically in the form of clipped hedges, topiary and lawns, is the backbone of a formal garden. A well-manicured look is extremely important. Keep the lawn mowed and the hedges trimmed perfectly. Easy-to-shape bushes and specimens that have naturally neat shapes are preferred. Using low-maintenance xerophytes (plants that can withstand droughts) is a new and welcome trend in formal gardens. Color - Formal gardens use a limited color palette. Annual and perennial beds can be laid out in geometrical shapes in the middle of lawns, or they can be incorporated as one-foot-wide beds along the hedges. They should be planted close together for a neat look. Use only two or three harmonious colors at a time. You may also want to include a few trees as accents that offer seasonal color. The following plants all work wonderfully in a formal garden. 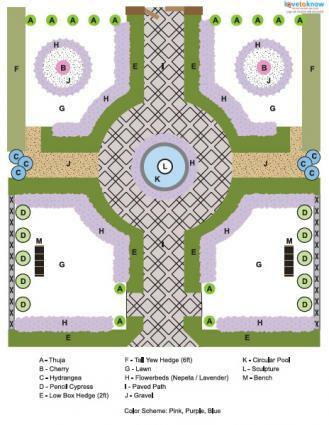 If you need some inspiration and a little guidance, download this free formal garden plan. Simply click on the text that says, "Click here for a printable pattern." You can then choose to save or print the image. If you need help downloading the printable, check out these helpful tips. Have a seat on your bench, be one with your garden, and you will instantly beginto feel the stress of your day melt away. For this reason alone, a formal garden is a fantastic addition to any landscape. Enjoy!